U N I Q U E.
I’m lazy, I never made the walk on foot, but I did it with “Camomilla”, my Vespa 50 and I know all the best views where to stop and recharge the batteries of life. I did various sports and I still have good breath and legs. How about walking in a classic way with sticks (nordic walking)? Come on, I’ll tell you anecdotes and curiosities learned by doing the tourist guide. I walk, strictly on foot, since I was very young. 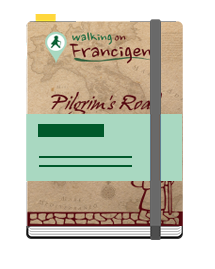 I walked as a child, a scout, a pilgrim. And I strive to best serve others and their “Cammino” by make available the many gifts I received in my life.